Blondie and Brownie: Thank you, thank you! 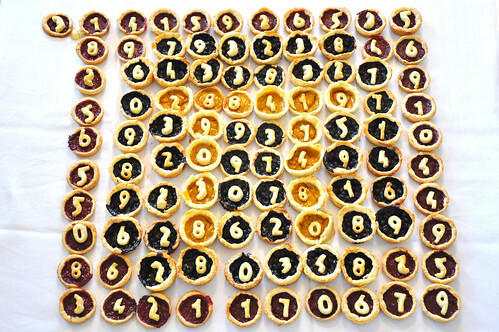 A couple of weeks ago, I shared with you my Serious Eats/Instructables Pi Day Contest Entries. Thanks to your votes I made it to the finals and last week I found out that my "Pies Are Round? No, Pi(es) Are Squared!" took first prize! First prize is an iPad2 that's going to be engraved with 314 digits of pie and the Serious Eats logo. I think I'll call it my Pi Pad. I'm super, super excited. There were a lot of AWESOME entries (you can check the other finalists and winner here). I've been longingly checking out iPads but with a little dude, it's not something that was in my budget in the near or far future. So psyched to be able to check out the exclusive Gourmet Live content now! So thank you, thank you, thank you again and again for your support! I wish I could give each of you a slice of pie! Aw, thanks so much, guys!